OpenCitations | The blog of OpenCitations (http://opencitations.net), which publishes bibliographic and data citations as Linked Open Data within the OpenCitations Corpus, and is developing tools and services over these citations. Among the external services used, the ORCID Public API is of crucial importance for the task of author disambiguation. During the OCC ingestion workflow, the main metadata of an article are usually retrieved from the Crossref API. While the JSON schema used by Crossref to return the information requested by its APIs includes a field for specifying the ORCID for each of the authors of an article, this field is usually blank, since such information is commonly not available in the data provided by publishers. We therefore routinely use the ORCID Public API to try to retrieve ORCIDs for all authors and editors named in the Crossref metadata for a given DOI. If the personal details and ORCID of that agent have not been previously recorded in the OpenCitation Corpus, we create a new agent record with that ORCID as external identifier, specified by means of the DataCite Ontology, and we associate this new agent with the new bibliographic resource identified by the input DOI. This process is repeated for all ORCIDs associated with that DOI. While the OCC ingestion workflow explained above regulates the ingestion of new citation data directly into the OpenCitations Corpus, the particular software library that implements this ingestion is generic in form, and is being reused in another application that we have recently released in prototype, namely BCite (sources available on GitHub). BCite is a Web application that enables users such as journal editors, starting with the ‘raw’ reference text strings supplied by the author as items in an article’s reference list, to obtain ‘clean’ verified and enriched bibliographic reference text strings, for inclusion in the reference list of the citing article they have in hand, so that accurate rather than erroneous references can be published in the version of record. Additionally, these references are at the same time transformed into RDF data compliant with the OpenCitation Data Model, including ORCIDs where available, thereby (in principle, although not yet in practice) permitting inclusion of the metadata for these cited works, and the citations for which they are the targets, into the OpenCitations Corpus itself. Report period: 1st May 2017 – 30 November 2018. OpenCitations (http://opencitations.net) is a scholarly infrastructure organization dedicated to open scholarship and the publication of open bibliographic and citation data by the use of Semantic Web (Linked Data) technologies, and engaged in advocacy for semantic publishing and open citations [Peroni and Shotton, 2018b]. It provides the OpenCitations Data Model [Peroni and Shotton, 2018d], the SPAR (Semantic Publishing and Referencing) Ontologies [Peroni and Shotton, 2018e] for encoding scholarly bibliographic and citation data in RDF, and open software of generic applicability for searching, browsing and providing APIs over RDF triplestores. It has developed the OpenCitations Corpus (OCC) [Peroni et al., 2017] of open downloadable bibliographic and citation data recorded in RDF, and a system and resolution service for Open Citation Identifiers (OCIs) [Peroni and Shotton, 2018c], and it is currently developing a number of Open Citation Indexes using the data openly available in third-party bibliographic databases. The Directors of OpenCitations are David Shotton, Oxford e-Research Centre, University of Oxford (david.shotton@opencitations.net), and Silvio Peroni, Digital Humanities Advanced Research Centre, Department of Classical Philology and Italian Studies, University of Bologna (silvio.peroni@opencitations.net). We are committed to open scholarship, open data, open access publication, and open source software. We espouse the FAIR data principles developed by Force11, of which David Shotton was a founding member (https://www.force11.org/group/fairgroup/fairprinciples), and the aim of the Initiative for OpenCitations (I4OC, https://i4oc.org), of which both David Shotton and Silvio Peroni were founding members, to promote the availability of citation data that is structured, separable, and open. Ivan Heibi was appointed to the 12 months Research Fellowship position funded by the Sloan Foundation. Ivan has been responsible for the development of new visualization and programming interfaces for exploring and making sense of the citation data included in the OCC and in the new OpenCitations Indexes, for the main part of the scripts related to the population and regular maintenance of COCI (The OpenCitations Index of Crossref open DOI-to-DOI citations, the first of the OpenCitations Indexes), and for conference presentations and paper writing. Silvio has been responsible for project management, for interview, appointment and supervision of the work of Ivan Heibi, for all aspects of software coding and technical developments required for the OpenCitations Corpus (OCC), the OpenCitations Indexes, and the Open Citation Identifier Resolution Service, for the ordering and management of new Sloan-funded hardware, and for conference presentations, paper writing and other forms of outreach and dissemination (e.g. blog and social networks). David has been responsible for project management, interaction with publishers, conference presentations, paper writing, other forms of outreach and dissemination (e.g. blog and social networks), for web site and data model revision, and for independent usability evaluation, stress-testing and design feedback of new user interfaces and applications. Project management has been straightforward, as should be the case, given the small size of our team. It has involved more than 1500 e-mail exchanges between David Shotton and Silvio Peroni, about 500 e-mail exchanges between Silvio Peroni and Ivan Heibi since November 2017, two dozen or so video conferences, some of which have involved collaborators, and an extended face-to-face meeting during the WikiCite 2017 Conference in Vienna at the start of the project and the Workshop on Open Citations 2018 in Bologna. We have together harmoniously developed the concept of and vision for OpenCitations as an infrastructure organization, the structure and content of the OpenCitations web site (http://opencitaitons.net), the classes and properties of our supporting SPAR ontologies (http://www.sparontologies.net), and the community of collaborators and users of our developments. This has involved outreach and dissemination at a number of international research conferences, involvement with publishers through the Initiative for Open Citations, and associated publications. We have studied and preliminarily tested a new scalable architecture centred on one powerful independent physical server, that both stores and handles all the data in the Corpus and in the new OpenCitations Indexes, and also offers adequate performance for query services. This server is supplemented by 30 additional small physical machines, Raspberry Pi 3Bs, working in parallel, each in charge of ingesting a defined set of reference lists and feeding the ingested data to the central server for further processing and storage as RDF in our Blazegraph triplestore. Currently, we release two different datasets – the OpenCitations Corpus and COCI, the OpenCitations Index of Crossref open DOI-to-DOI citations – and several interfaces so as to make these data queryable from different access points. As of 29th December 2018, the OpenCitations Corpus (OCC) contains information about 13,964,148 citation links to 7,565,367 cited resources, ingested from 326,743 citing bibliographic resources obtained from the Open Access corpus of Europe PubMed Central and from the citation data imported from the EXCITE project. The main part of the development effort in the past months has been spent in implementing ingestion strategies that allow partners to provide us citation data, stored according the OpenCitations Data Model [Peroni and Shoton, 2018b], so as to be added directly into the Corpus. In September 2018, we successfully completed the ingestion of the initial data coming from the EXCITE project (citations from social sciences scholarly papers published by German publishers), and we are actively interacting with the LOC-DB project and the Venice Scholar Index so as to add their data to the OCC as well. In ongoing work, we are also collaborating with arXiv and EXCITE to harvest all the references from all PDF documents in the arXiv ePrints collection, to record these in RDF according to the OpenCitations Data Model, and to ingest them into the OpenCitations Corpus, as well as creating a new Index of these citations. The first of these OpenCitations Indexes is COCI, the OpenCitations Index of Crossref open DOI-to-DOI citations, an RDF dataset containing details of all the citations that are specified by the open references to DOI-identified works present in Crossref, as of the latest COCI update. COCI does not index Crossref references that are closed, nor Crossref references to entities that lack DOIs. These citations are treated as first-class data entities, with accompanying properties including the citations timespan and possible kinds of self-citation characteristics, modelled according to the index data model described in the OpenCitations Indexes page. COCI was launched in July 2018, and the most recent update of COCI is dated 12 November 2018. It presently contains 449,840,503 citations between 46,534,705 bibliographic resources. COCI is the first citation index released by OpenCitations, being a bibliographic index recording citations between publications that permits the user to establish which later documents cite earlier documents, and to create citation graphs of these citations.). While full coverage of the scholarly citation graph depicted by the aforementioned datasets (or as full as practically possible) is required for the calculation of certain bibliometric indicators such as journal impact factors and individual h-indexes (Hirsch numbers), partial coverage while OCC grows is still of value, since it includes citations of all the most important biomedical papers obtained from the Open Access Subset off PubMed Central. These can be easily recognized by their large number of inward citation links, and can be used to explore the development of disciplines and research trends. In addition, COCI, with its wider scope, has sufficient coverage to be used for large-scale bibliometrics analysis. Because of unavoidable academic teaching commitments for Silvio Peroni, the installation of the new Sloan-funded hardware for OCC, purchased in autumn 2017, had to be postponed. All the services (old and new) of OpenCitations were successfully transferred to our new server in October 2018. In order to implement such transition, the ingestion process of the OCC was halted, so as to allow Silvio Peroni to properly test the new hardware and to extend the existing ingestion software so as to be usable within the new parallel processing architecture. The final tests are currently running, and we will recommence the full ingestion process of the OCC using the new hardware configuration, with its greatly enhanced ingest rate, in January 2019. In the meantime, the new infrastructure has been used to allow us to create COCI, so far the largest RDF dataset of open citation data available worldwide. In addition, we have completed the transition of all the OpenCitations software from the old GitHub repository (i.e. https://github.com/essepuntato/opencitations) to a new GitHub organization, namely https://github.com/opencitations. This organisation includes several repositories which permit third parties to initiate the whole suite of OpenCitations software on a local machine. This is of key importance for the resilience of this open source project. SPARQL, the query language used to interrogate RDF triplestores, is a quite powerful language. However, one needs appropriate skills with Semantic Web technologies to master it for solving even easy search tasks. Thus normal web users are unable to use appropriately such technologies if not appropriately instructed, leaving all these technologies in the hands of a limited number of experts. The datasets made available by OpenCitations suffered similar issues. Initially, the goal we had was to develop ad-hoc user interfaces to abstract the complexities of the SPARQL endpoints into well-designed Web interfaces that anyone could use. During the development, though, we thought it would be better to develop generic frameworks for building customizable interfaces that allow one to expose, in a more human-understandable way, RDF data stored in any RDF triplestore and accessible through any SPARQL-endpoint, so as to forster reuse of such software in contexts that, in principle, might go far beyond the OpenCitations domain. RAMOSE, a Python application that permits one to easily create and serve a conventional HTTP REST API over a SPARQL endpoint. All these tools provide a configurable mechanism – by means of one single textual configuration file – that allows one to generate Web-based interfaces to any SPARQL endpoint. In practice, these tools are flexible Web-interface makers to RDF data, and as such represent a significant advance available to the entire community. All these applications have been used to produce several interfaces to all the datasets released by OpenCitations. In particular, we have created user-friendly textual search interfaces (via OSCAR) both for the OCC (see the search box now on the OpenCitations home page, and the related search page) and for COCI (see the related search page). We have additionally developed browsing applications (via LUCINDA) to permit humans an easier navigation of all the entities included in the OCC (e.g. see the bibliographic resource br/1791056) and in COCI (e.g. see the citation oci:02001010806360107050663080702026306630509-02001010806360107050663080702026305630301). Finally, we have also implemented REST HTTP APIs (via RAMOSE) for simplifying the queries to both datasets, the OCC and COCI, by Web developers with no expertise in Semantic Web technologies. In addition, in order to demonstrate its flexibility, we have also created two web pages using OSCAR, LUCINDA, and RAMOSE for permitting similar tasks (text query, browsing, and REST APIs) on the scholarly data in Wikidata / WikiCite – another project recently funded by the Alfred P. Sloan Foundation. These interfaces have been introduced in two distinct event: during the hack day of the Workshop on Open Citations 2018 and during the WikiCite 2018 Conference. A further prototypical interface / service has been recently proposed so as to try to gather additional open citation data to include in the OCC, involving users of the scholarly domain such as editors and researchers. This application is called BCite [Daquino et al., 2018]. BCite is designed to provide a full workflow for citation discovery, allowing users to specify the references as provided by the authors of an article, to retrieve them in the required format and style, to double-check their correctness, and, finally, to create new open citation data according to the OpenCitations Data Model [Peroni and Shotton, 2018d], so as to permit their future integration into the OCC. While presently only a prototype, we received several commendations for this tool, and we are currently studying funding strategies to develop a full standalone application that can be used by anyone and that allows users to directly interact with the OCC, so as to upload new data into the Corpus. All the information regarding each citation would be available in one place. Citations become easier to describe, distinguish, count and process. If available in aggregate, citations become easier to analyze using bibliometric methods, for example to determine how citation time spans vary by discipline. The metadata describing the citation must be definable in a machine-readable manner. Such metadata must be storable, searchable and retrievable. Each citation must be identifiable, using a globally unique Persistent Identifier. There must be a Web-based resolution service that takes the identifier as input and returns a description of the citation. the fourth requirement by creating a resolving service for OCIs at http://opencitations.net/oci and additional software (in Python) for retrieving information about a particular citation identified by an OCI. To date, OCIs have been actively used both in the OCC and in COCI to identify all the citations they contain. In addition, we now plan to create and publish additional OpenCitations Indexes of all the citations DataCite, Wikidata and (of course) the OCC, which we hope will be of great benefit to bibliometricians in their analysis of citation networks, self-citation, etc., and in the calculation of citation metrics. OCIs have been recognised by the EU Project FREYA as unique global identifiers for bibliographic citations. Matteo Romanello of the Digital Humanities Laboratory at the University of Lausanne is using OCDM for modelling citations of the classical literature within ancient Venetian documents in the context of the Venice Scholar Index, and is currently working on producing a dataset of citation data compliant with OCDM so as to be ingested in the OCC. The Linked Open Citations Database (LOC-DB) at the University of Mannheim is using OCDM to model their data, with the aim of producing them accordigly with such model so as to be ingested in the OCC. 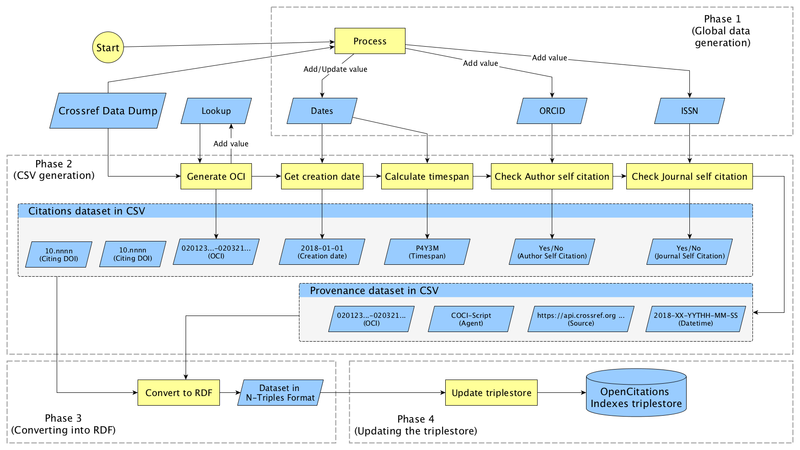 Steffen Staab (University of Koblenz) and Philipp Mayr (GESIS) are running the EXCITE Project, which uses OCDM to model their citation data, and already adopted the OCC as their publication platform. In fact, in September 2018, ~1 million citations coming from the EXCITE Project were successfully ingested in the OCC. Sergey Parinov is technically leading CitEcCyr, which is an open repository of citation relationships obtained from research papers in the Russian language and Cyrillic script. This project intends to model its citations using the OCDM, and will use the OpenCitations Corpus as its publication platform. Dominique Rouger developed a Web application that provides a visual graph representation of citation links in COCI. From May 2017 to November 2018, the official OpenCitations website has been accessed ~5.8M times – we have excluded from this list the hits done by well-known spiders and crawlers. It is worth mentioning that the pages related to the data available and the services for querying them (i.e. “/corpus”, “/sparql”, and “/index” in the following diagram) have together gained a very high percentage of the overall accesses, showing that the main reason people access the OpenCitations website is to explore and use the data in the OCC and in COCI. It is also clear how the introduction of COCI brought additional accesses to the OpenCitations services, and the trend is increasing – e.g. 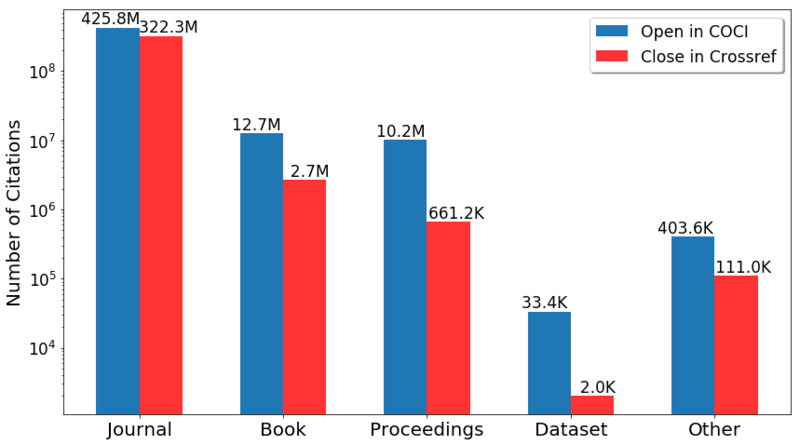 in December 2018 (not shown in the following diagram) we got more than 200M accesses to “/index”, mainly related to the use of the COCI REST APIs. From May 2017 to November 2018, the documents (i.e. [Peroni and Shotton, 2018b] [Peroni and Shotton, 2018c] [Peroni and Shotton, 2018d]) and the dumps of the OCC and of COCI available on Figshare (see http://opencitations.net/download) have been viewed 37,960 times and downloaded 3,842 times. The figure below summarizes how many views and downloads such resources have received month by month. For example, the latest version of COCI in CSV has been downloaded 239 times since its release in November (see https://doi.org/10.6084/m9.figshare.6741422.v3). 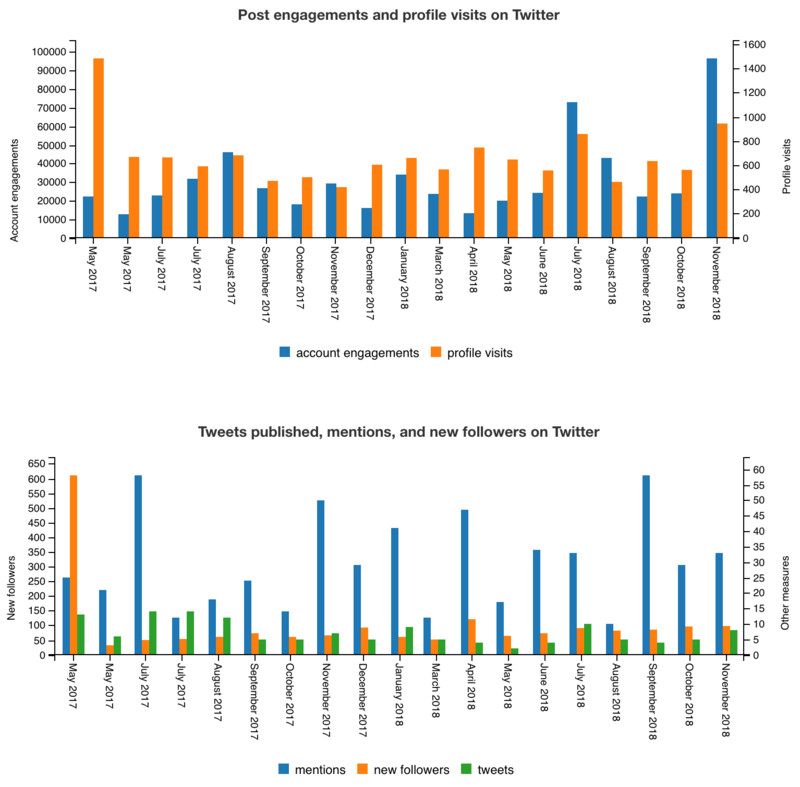 In the past nineteen months, the posts published by the official Twitter account of OpenCitations have been engaged by 599,200 distinct Twitter accounts, the Twitter profile (@opencitations) has been visited 12,719 times and has been mentioned in 565 tweets written by others, and it has collected an additional 1,925 followers. The diagram below shows all these statistics month by month. Although we made relatively few new blog posts in the reporting period (there have been twenty more since then), from May to November 2018, the blog dedicated to OpenCitations (https://opencitations.wordpress.com) received 19,454 visits by 15,184 distinct users. As shown in the diagram below, the biggest peaks in terms of visits has been in July 2018 (the month when we launched COCI) and in September 2018 (the month of the Workshop on Open Citations). The United States Global Change Information System, which encodes federal information relating to climate change, makes extensive use of SPAR ontology terms. The United Nations Document Ontology (UNDO) has been specifically aligned with FaBiO. Wikidata has many classes that have been alighted with FaBiO or CiTO. DBPedia’s DataID ontology uses the FaBiO and DataCite ontologies. W3C’s Data on the Web Best Practices: Dataset Usage Vocabulary uses SPAR Ontologies. For the full list, see http://www.sparontologies.net/uptake. To date, as far as we are aware, more than 677 papers have been published that cite or use one or more of the SPAR ontologies. For the full list, see http://www.sparontologies.net/uptake#publications. OpenCitations and the Initiative for Open Citations, despite the similarity of title, are two distinct organizations. The primary purpose of OpenCitations is to host and build the OpenCitations Corpus (OCC) and the OpenCitations Indexes, as long as additional service to browse, query, and analyse citation data. In contrast, the Initiative for Open Citations (I4OC, https://i4oc.org) is separate and independent organization, whose founding was spearheaded by Dario Taraborelli of the WikiMedia Foundation. OpenCitations is one of several founding members of the Initiative for Open Citations, as documented at https://i4oc.org/#founders. I4OC is a pressure group to promote the unrestricted availability of scholarly citation data, but does not itself host citation data. Because open reference lists are necessary for the population of OCC, we at OpenCitations have devoted considerable effort to promoting I4OC’s aims, and we host the I4OC web site on behalf of that community. Within a short space of time, I4OC has persuaded most of the major scholarly publishers to open their reference lists submitted to Crossref, so that the proportion of all references submitted to Crossref that are now open has risen from 1% to over 50%. These are now available for OpenCitations to harvest into the OpenCitations Corpus and publish in RDF, as well as for others to harvest and use as they wish [Shotton, 2018]. 16 Jan 2018: Oxford University Press opens its references! Projects: Metrics, visualizations and other projects. The uses and applications of open citations, and bibliometric analyses and metrics based upon them. All the sessions were recorded and are available on the official YouTube channel of the University of Bologna, and are linked (together with slides) at the website of the workshop – https://workshop-oc.github.io. A further Workshop on Open Citations is being planned for autumn 2019. A further presentation on Open Citation Identifiers will be given at the 2019 PIDapalooza Conference of Persistent Identifiers in Dublin in January 2019. We have tweeted about the project and related matters under the names @opencitations, @dshotton, @essepuntato, @ivanHeiB, @workshop_oc, and @i4oc_org. While presently the OpenCitations Corpus has only partial coverage, our aim is that OpenCitations should become a comprehensive source of open citation information from all disciplines of scholarly endeavour, used on a daily basis by scholars worldwide, to equal or better the commercial offerings from Clarivate Analytics (Web of Science) and Elsevier (Scopus). We also wish to develop effective graphical user interfaces to explore the citation network, and analytical tools over our open data. Since the OCC and COCI data are all open and available for others also to build such tools, we anticipate that such developments will best be undertaken collaboratively, under some open community organization, and indeed such development is currently being undertaken in collaboration with colleagues from CWTS at the University of Leiden, famous for their development of VOSviewer. In order to fully support open scholarship, OpenCitations need to mature from being an academic research and development project to become a recognised scholarly infrastructure service such as PubMed. We wish to avoid becoming a commercial company, and see our development better served by being ‘adopted’ by a major established scholarly institution such as national or university library or an internationally recognised centre providing scholarly bibliographic services, that has already shown a commitment to open scholarship, where the interaction between that institution and OpenCitations would be mutually beneficial. To this end, we are currently in the mid-phase of negotiations with two institutions. The grantees wish to express their deep gratitude to the Alfred P. Sloan Foundation for financial support enabling them to undertake the OpenCitations Enhancement Project, without which the rapid developments reported here would not have been possible. The Wellcome Trust, which funds research in big health challenges and campaigns for better science, has agreed to fund The Open Biomedical Citations in Context Corpus, a new project to enhance the OpenCitations Corpus, as part of the Open Research Fund programme. The Open Biomedical Citations in Context Corpus, funded by the Wellcome Trust for 12 months from March 2019, will make the OpenCitations Corpus (OCC) more useful to the academic community by significantly expanding the kinds of citation data held within the Corpus, so as to provide data for each individual in-text reference and its semantic context, making it possible to distinguish references that are cited only once from those that are cited multiple times, to see which references are cited together (e.g. in the same sentence), to determine in which section of the article references are cited (e.g. Introduction, Methods), and, potentially, to retrieve the function of the citation. by developing appropriate user interfaces for querying and browsing these new data. We are looking for a post-doctoral computer scientist / research engineer specifically to achieves the aforementioned objectives. This post-doctoral appointment will start the 1st of March 2019. We seek a highly intelligent, skilled and motivated individual who is expert in Python, Semantic Web technologies, Linked Data and Web technologies. Additional expertise in Web Interface Design and Information Visualization would be highly beneficial, plus a strong and demonstrable commitment to open science and team-working abilities. The minimal formal requirement for this position is a Masters degree in computer science, computer science and engineering, telecommunications engineering, or equivalent title, but it is expected that the successful applicant will have had research experience leading to a doctoral degree. The position has a net salary (exempt from income tax, after deduction of social security contributions) in excess of 23K euros per year. The formal advertisement for this post – which will be held at the Digital Humanities Advanced Research Centre (DHARC), Department of Computer Classical Philology and Italian Studies, University of Bologna, Italy, under the supervision of Dr Silvio Peroni – is published online, and it is accompanied by the activity plan (in Italian and English). The application must be presented exclusively online by logging in the website https://concorsi.unibo.it (default in Italian, but there is a link to switch the language in English). People who do not have a @unibo.it email account must register to the platform. The deadline for application is the 25th January 2019 at 15:00 Central Europe Time. Please feel free to contact Silvio Peroni (silvio dot peroni at unibo dot it) for further information. Ludo Waltman – Centre for Science and Technology Studies (CWTS), Leiden University, Netherlands. In addition, the project is supported by Europe PubMed Central (EMBL-EBI, Hinxton, UK). In a previous series of blog posts we proposed the treatment of bibliographic citations as first-class data entities, permitting citations to be endowed with descriptive properties. In doing so, we outlined some specific requirements, namely that the citations should be machine readable, should conform to a specific data model (in this case the OpenCitations Data Model), should be stored in an accessible database under an open license, and should be identified using global persistent identifiers (specifically Open Citation Identifiers) which are resolvable using an identifier resolution service (namely the Open Citation Identifier Resolution Service). In this blog post, we introduce COCI, the OpenCitations Index of Crossref open DOI-to-DOI references1, our first open citation index, in which we have applied the concept of citations as first-class data entities to index the contents of one of the major open databases of scholarly citation information, namely Crossref, and to render and make available this information in machine-readable RDF. Crossref contains metadata about publications (mainly academic journal articles) that are identified using Digital Object Identifiers (DOIs). For about half of these publications Crossref also stores the reference lists of these articles submitted by the publishers (for discussion of why this is not true for all the publications, see this previous blog post). Many of these references are to other publications bearing DOIs that are also described in Crossref, while others are to publications that lack DOIs and do not have Crossref descriptions. COCI is an index of all the open DOI-to-DOI citations present in Crossref, and presently includes more than 300 million citations, obtained by parsing the open reference lists of the articles deposited there. COCI is available at http://opencitations.net/index/coci, and is released under a CC0 waiver. COCI does not index Crossref references that are not open, nor Crossref open references to entities that lack DOIs. What is an open citation index? A citation index is a bibliographic index recording citations between publications, allowing the user to establish which later documents cite earlier documents. Several citation indexes are already available, some of which are freely accessible but not downloadable (e.g. Google Scholar), while others can be accessed only by paying significant access fees (e.g. Web of Science and Scopus). An open citation index contains only data about open citations, as defined in . OpenCitations is a scholarly infrastructure organization dedicated to the promotion of semantic publishing by the use of semantic web (linked data) technologies, and engaged in advocacy for semantic publishing and open citations. It provides the OpenCitations Data Model and the SPAR (Semantic Publishing and Referencing) Ontologies for encoding scholarly bibliographic and citation data in RDF, and open software of generic applicability for searching, browsing and providing REST APIs over RDF triplestores. It has developed the OpenCitations Corpus (OCC) of open downloadable bibliographic and citation data recorded in RDF, and a system and resolution service for Open Citation Identifiers (OCIs), and it is currently developing a number of Open Citation Indexes using the data openly available in third-party bibliographic databases. The citations they contain are all open . The RDF statements for each citation record the basic properties shown in the following figure, which is based on the Citation Typing Ontology (CiTO) for describing the data, and the Provenance Ontology (PROV-O) for the provenance information. The data model used for describing the citation data included in any Open Citation Index. Over the past few months, we have parsed the entire Crossref bibliographic database to extract all the DOI-to-DOI citations included in the dataset, as well as additional information about each citation, specifically its creation date (i.e. the publication date of the citing entity) and the citation time span (i.e. the interval between the publication date of the cited entity and the publication date of the citing entity, to an accuracy determined by these publication dates as recorded in Crossref). These data for the open citations are now made available in COCI. Each case-insensitive DOI is first normalized to lower case letters. Then, after omitting the initial “doi:10.” prefix, the alphanumeric string of the DOI is converted reversibly to a pure numerical string using the simple two-numeral lookup table for numerals, lower case letters and other characters presented at https://github.com/opencitations/oci/blob/master/lookup.csv. Currently COCI contains 316,243,802 citations and 45,145,889 bibliographic resources. We plan to update COCI at least every six months as more open DOI-to-DOI citations appear in Crossref. All the data in COCI are available for inspection, download and reuse in the following ways. curl -L -H "Accept: text/csv" "https://w3id.org/oc/index/coci/sparql?query=PREFIX%20cito%3A%20%3Chttp%3A%2F%2Fpurl.org%2Fspar%2Fcito%2F%3E%0ASELECT%20%3Fcitation%20%3Fcreation%20%7B%20%3Fcitation%20a%20cito%3ACitation%20%3B%20cito%3AhasCitationCreationDate%20%3Fcreation%20%7D%20LIMIT%201"
It is worth mentioning that the results can be also returned in JSON (using “Accept: application/json” in the header of the request) or XML (using “Accept: application/xml” in the header of the request). For example, accessing the long URL starting with “https” of the above request with a browser will return an XML document describing the same result. or for the citation identified by the input Open Citation Identifier (OCI), e.g. https://w3id.org/oc/index/coci/api/v1/citation/02001010806360107050663080702026306630509-0200101080636102704000806). If you would like to suggest an additional operation to be included in this API, please use the issue tracker of the COCI API available on GitHub. An interface providing a free text search over the contents of COCI is available at http://opencitations.net/index/coci/search. It allows one to search for citation data according to the same operational principles implemented in the REST API discussed above. However, in this case, the result are returned in tabular form through a web interface implemented by means of OSCAR, the OpenCitations RDF Search Application, e.g. http://opencitations.net/index/coci/search?text=10.1186%2F1756-8722-6-59&rule=citingdoi. The dump of all the citation data available in COCI, including their provenance information, is downloadable from Figshare. These data are available in CSV and N-Triples formats, and each dump has a DOI assigned so as to be citable. Download links are available at http://opencitations.net/download#coci. A new dump will be made each time COCI is udpated. curl -L -H "Accept: text/turtle" "https://w3id.org/oc/index/coci/ci/02001010806360107050663080702026306630509-0200100000236122213123702000"
In this blog post we have introduced COCI, the OpenCitations Index of Crossref open DOI-to-DOI references, a citation index which contains more than 310 million open citations created from the ‘Open’ references included in Crossref. We plan soon to extend COCI to additionally include those DOI-to-DOI citations extracted from the ‘Limited’ set of Crossref reference data. At Crossref’s request, we have changed the originally proposed description of COCI from “the Crossref Open Citation Index (COCI)” to “COCI, the OpenCitations Index of Crossref open DOI-to-DOI references”, to make clear that COCI is an OpenCitations index and to avoid any implication that COCI is a Crossref service. We apologize for the initial ambiguity of our original wording and any confusion this may have caused.